Place two large (baking sheet sized) sheets of parchment paper side by side on a flat surface. Have a rolling pin and a third and fourth sheet of parchment paper in reserve nearby. In a heavy pan, bring the sugar, salt and water to a boil, stirring until the sugar dissolves. Lower heat and cook, without stirring until you reach softball stage (238 degrees). Remove from heat and stir in the pepitas and chipotle pepper. Stir about 4 minutes or until the sugar crystallizes. Return to heat and, stirring continuously until the sugar melts again (it may appear to further crystallize before it begins to melt) and turns a dark brown. Pour immediately on the the parchment paper, placing the extra sheets of parchment paper on top of the brittle and using the rolling pin, roll smooth. Remove the top sheets of parchment paper and allow the brittle to cool completely. Remove parchment and break into pieces. 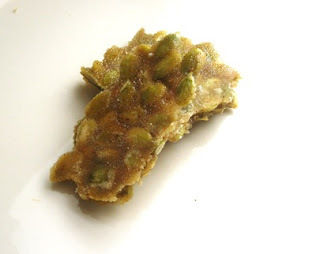 For this recipe I used the same basic recipe and technique as I would to make nut brittle but subsituted pumpkin seeds and added some spice. The result: a tasty, easy treat with a hint of smoky spice. One note: the spice makes the brittle appear slightly grainy when in actuality the texture is quite smooth.